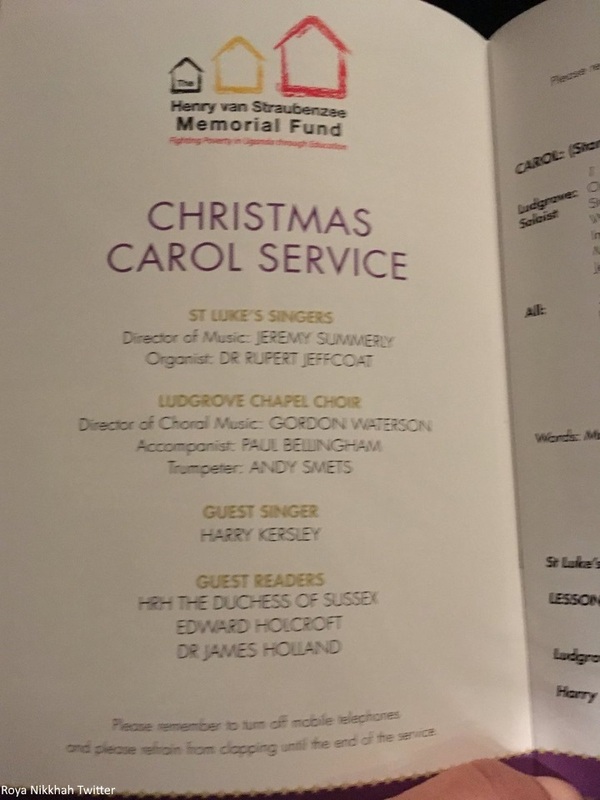 The Duke and Duchess of Sussex attended a carol service at St Luke's, Chelsea, in support of the Henry van Straubenzee Memorial Fund, which was set up in memory of a school friend of both Harry and William, who died in a tragic car crash in 2002. The Duchess wore a navy dress and coat. Click here to visit the Mail Online to see additional images. Last night reports surfaced claiming Harry and Meghan would be in attendance with news the Duchess was asked to give a reading at the annual event. Harry and Meghan attended the Surrey wedding of Charlie van Straubenzee and Daisy Jenks in August, Harry served as Best Man. The van Straubenzee family have a long history with the royals. Harry has been close friends with Charlie since they were children at Ludgrove prep school together. Both William and Harry were Usher's at the 2013 society wedding of Charlie's brother Thomas to Northumberland Heiress Melissa Percy. Thomas is also Princess Charlotte's godfather. The two families have shared an enduring bond since childhood. I thought it a very nice touch they asked Meghan to read at the service. I imagine she's become close to the family over the past couple of years. 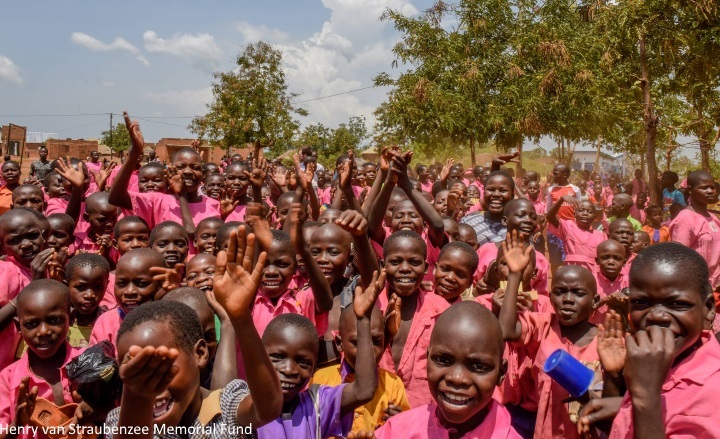 The Henry van Straubenzee Memorial Fund aims to improve the quality of education in impoverished rural Ugandan schools by investing in buildings and providing hygienic and educational resources. They form partnerships with schools to ensure that even the poorest children have access to high quality education. The Fund currently helps over 28,000 children across 40 nursery, primary and secondary schools to be happier and healthier, with a good education. William and Harry have been joint Patrons since 2009. 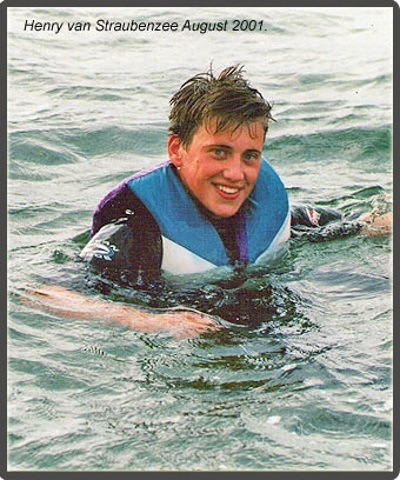 Henry van Straubenzee pictured in 2001, a year before he tragically died aged 18. Both princes were "devastated" by the loss. During a speech in 2011, Harry described Henry as his "best friend", before adding "It’s never easy losing someone close to you - and when it is family it is even harder. I cannot imagine what it is like to lose a child". A closer look at St Luke's Church. 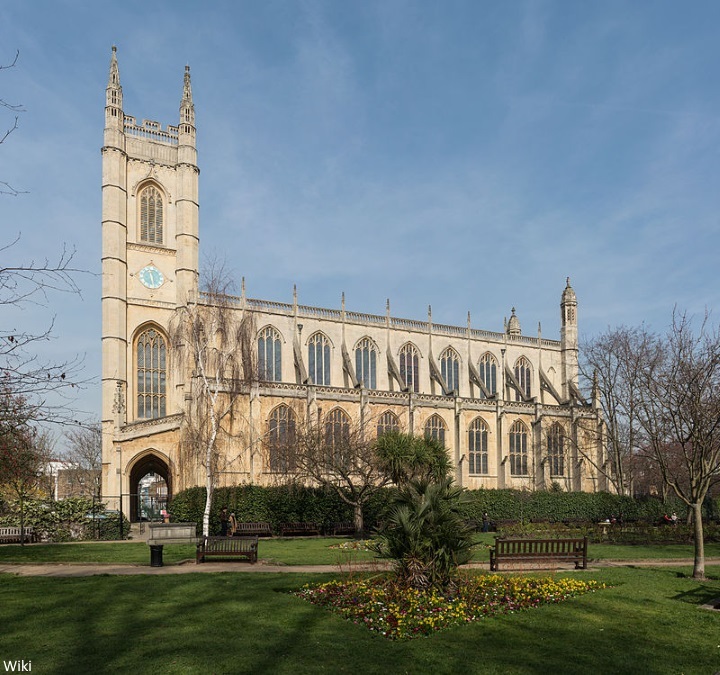 Notably, Charles Dickens was married at St Luke's to Catherine Hogarth, who lived in Chelsea, on 2 April 1836, two days after the publication of the first part of the Pickwick Papers, his first great success. Artist Robert Gill was married on 25 May 1825, shortly before returning to India, where he spent the rest of his life, much of it copying the paintings of the Ajanta Caves. A peek inside the church during last year's church service. Roya Nikkhah revealed Harry delivered a "powerful and moving" appeal on behalf of the charity. Below, a glimpse at the Order of Service. 'Meghan, who is pregnant with her first child, gave a reading from the poem “Our Deepest Fear” by Marianne Williamson at the Christmas carol service, which Harry attended solo last year after announcing his engagement to Meghan. 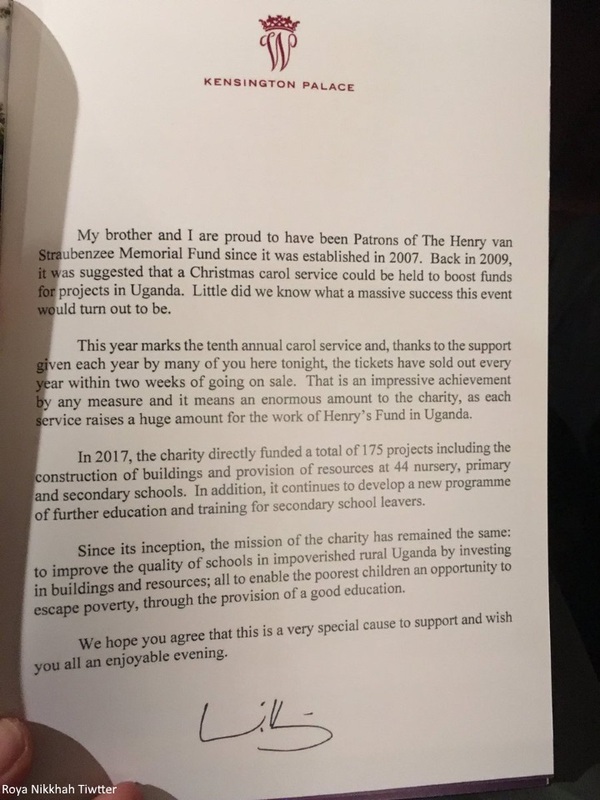 Before Meghan made her reading she said she and Harry believed it was the perfect reading because “it sums up he spirit of what the Henry van Straubenzee Fund does to empower young children. The stirring poem Meghan read includes a powerful opening: "Our deepest fear is not that we are inadequate. Our deepest fear is that we are powerful beyond measure." A written message from Prince William. A very sweet comment from a guest at the service. In other news, Kensington Palace confirms the Duchess stepped out privately last night for the London stop of Michelle Obama's book tour for her memoir Becoming at the Southbank centre. 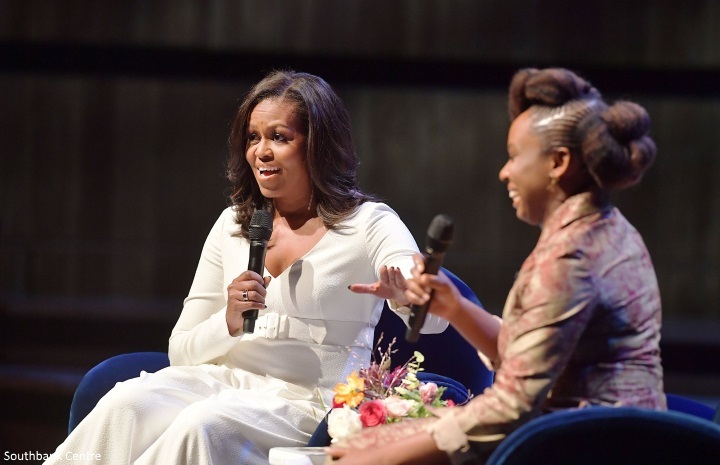 Mrs Obama discussed the book on stage with novelist Chimamanda Ngozi Adichie. Prince Harry has enjoyed a very warm relationship with the Obamas over the years, they both supported the Invictus Games during their time in the White House and afterwards. Meghan and Michelle share a passionate believe in empowering and nurturing young women and girls. After the event, they enjoyed a lengthy private meeting. The friend added that the duchess and Mrs Obama had formed a strong bond and were expected to stay in close contact. The friend also revealed that Meghan felt she had been welcomed in London. The Standard understands that many of the charities to which she is due to be appointed royal patron in the new year will be London-orientated. During an interview for Good Housekeeping, Mrs Obama spoke about Meghan's role and offered advice. "Like me, Meghan probably never dreamt that she’d have a life like this, and the pressure you feel – from yourself and from others – can sometimes feel like a lot,” she said. So my biggest piece of advice would be to take some time and don’t be in a hurry to do anything. I spent the first few months in the White House mainly worrying about my daughters, making sure they were off to a good start at school and making new friends before I launched into any more ambitious work. I think it’s okay – it’s good, even – to do that,” she continued. What I’d say is that there’s so much opportunity to do good with a platform like that – and I think Meghan can maximise her impact for others, as well her own happiness, if she’s doing something that resonates with her personally,” she said." During last night's event, Mrs Obama spoke candidly about the negative reaction and coverage she received as First Lady. It sounds like the two ladies had a wonderful meeting. I expect Michelle offered Meghan advice and words of encouragement. I imagine Meghan sees the former First Lady as a role model. It's no mean feat attending a public event under the radar. It clearly meant a lot to her to be there. Finally, royal reporter Rebecca English reports helping women in developing countries will be a focus of Meghan's work next year. 'The Duchess of Sussex is to put education for women in developing countries at the heart of her public work, when she announces her first royal patronages next year, Mail Online can reveal. 'Meghan, 37, has been having secret briefings with a number of organisations, including CAMFED – the Campaign for Female Education – which works in several African countries, including Zambia, which was visited by Prince Harry last week. It is understood that she and Harry are keen to work together on the issue in their role as roving Commonwealth youth ambassadors. Meghan is a passionate advocate of the work of charity CAMFED, which believes one of the best way to alleviate poverty and inequality is through education. It has already affected the lives of nearly three million girls and young women across sub-Saharan Africa. Its CEO, Lucy Lake, who was with the sixth in line to the throne in Zambia, revealed to the Mail that she had briefed his wife privately at Kensington Palace earlier this year about their work in the country, as well as Zimbabwe, Ghana, Tanzania and Malawi. Lucy said: ‘We had the opportunity to meet with the Duchess in the spring. As an organisation our team very much represents what we are working towards and that was why the Duchess was interested to meet with us and hear more about that. I expect we'll hear news regarding engagements in the coming days. Meghan is beautiful, has beautiful pregnant women. And always available to do a service, I like that. She is magnificent simply. The First Noel is unknown in origin but is generally thought to be English dating back to the sixteenth century. There is a misconception that the First Noel was French and it is believed that this is because of the French spelling of Noel as opposed to the olde English Anglo-Saxon spelling of the word as in Nowell. A friend acting on instruction from the PR people in Kensington palace perhaps? Probably true; before those mysterious "royal insiders" start giving their twisted version of what the private discussion was about. I am delighted that Meghan has formed a bond with our exceptional former First Lady, someone I admire very much. What a wonderful thing the Princes did in establishing this fund for their late friend. I can't tell much about Meghan's dress and coat, very plain and simple it appears. Chimamanda ngozi amichie is a tremendous writer. I have read.one of her books and loved it. Shes also a strong advocate for womens empowerment as well. She would be a great partner for Meghan in that area. Love her. Nice to see Meghan with Harry at the carols service this year. I'm impatient to hear the announcement of her patronages. I thought that they would've been announced within the first month or two of the wedding -- I didn't realize how much more would go into it before formally announcing. I'm excited to see which direction she takes in the next year. I know we can't see much from those photos, but Meghan really does seem pregnant now. This must be a really exciting Christmas for her and Harry. 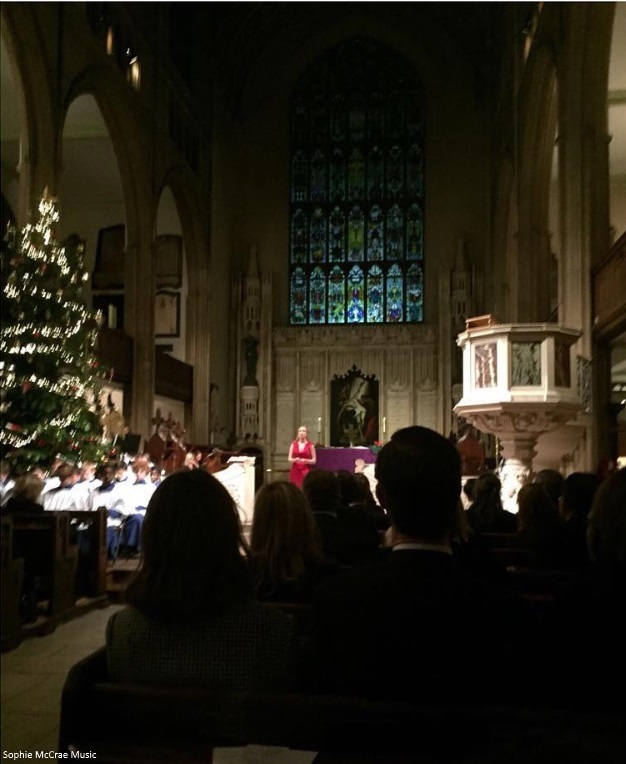 I wonder why William and Kate weren't at the carols service? Uh, they are at the white tie diplomatic event at BP. They are at the Diplomatic Reception at the palace. I too was very anxious to find out Meghan's charity causes, in fact I wanted to know the next day :) But from what I've heard there is quite a bit of vetting of the charities that goes on and that takes some time. I've heard that one might be announced before years end with the rest being announced after the first of the year. William and Kate attenced the formal diplomatic reception at Buckingham Palace which ais why they were not at the carol service. I'm just impressed about how much foresight and thought she's putting into the work she's going to do. The briefing was last spring! Gosh, I'm amazed. I hope that she does take some time to do relationship building as Michelle advised, I think that will serve her well in the future. So impressed as usual by Meghan and it was my hope that she would meet my Forever First Lady or advise because the press in the UK as been particularly unfair and relentless lately. I'm so glad I have Mad About Meghan to celebrate the Duchess. I won't start a political discussion here, but Michelle was a political figure and bound to be fairly criticized. She didn't shy away from controversial political positions. I see that differently than what Meghan is going through. But I'm glad she can use her as a role model. No doubt Michelle has a lot of good tips and advice. I'm glad they have that connection. I agree AZ, I saw nothing political in this. How many very famous women get to meet, or have the time to receive advice or speak of the same interests with other famous women they admire? You are right that she was fairly criticized for politics, but the criticism Michelle Obama was referring to was doubtless the unfair deluge that hit her personal appearance, her intelligence, her background, and everything that had nothing to do with politics and a whole lot to do with racism. It was a shame what she had to endure, as it is a shame what Meghan is having to endure. She is being demolished because she is American and how dear she come in with good work ethics to ruffle feathers She is certainly being marginalized because she is upstaging the RF. I sincerely hope they are aware that they represent the Commonwealth and Meghan and Harry are very popular in those countries Since Meghan married Harry the BRF is now of increased relevance Don't bite the hands that feeds you because these leaks just didn't happen out of thin air Hopefully Michelle, Oprah and Gayle can guide her through this rough patch I will continue praying for her The news have never gone after a pregnant royal woman before Why Meghan and why now !! Michelle endured abuse for being the first black first lady. Meghan is the first back woman in the royal family. There are definitely parallels without getting political. I disagree, Michelle was criticized for her looks and the way she dressed which has nothing to do with politics. Saying things like she looked manly because she wore a sleeveless dress and her arms are toned and other disgusting things. Which is what Meghan is going through right now so she’s the perfect person to give Meghan advice on how to navigate being a high profile black woman in a predominantly white space while not letting the negativity dim her light. Anonymous 02:13 I would not say that Meghan is upstaging the Royal Family. The negative press she is getting is an attack by the tabloids. From time to time they do it to all members of the family. As for Meghan accepting guidance from Michelle, Oprah and Gayle (King?). I don't think so. Michelle perhaps, as she has been First Lady. There are a few, although not many, similarities in the two positions. But Oprah and Gayle are entertainers, TV personalities. Their positions have nothing to do with being Royal, being British, being appropriate, or fitting in with life in "The Firm." I agree. Michelle is who Meghan needs to see right now with all these negativity around her. She is American, woman of color and in a very high profile position just like Meghan. I criticized things that Michelle did and said politically. It had nothing to do with race. For example, I thought her school-nutrition programs were misguided. It had nothing to do with race. Can I say it again? It had nothing to do with race. I actually like her MUCH better now that she's a former first lady. I find now that she's more removed from politics (and not commenting on so many political things) she's much more interesting and inspirational. That doesn't mean there aren't racists out there. Of course there are. But not everyone is racist and I honestly don't think that is the majority opinion. We can dissent politically, fashionwise, or whatever else without reducing each other to the color of our skin. I'm honestly a little sad that any discussion or criticism of Meghan is always boiled down to race. I'm sick of it, honestly. It makes me really not care or want to pay attention to her. I don't even like reading the comments here anymore (though I lurked on the DK blog for YEARS), because anything and everything is labeled as racist. It's so out of line. And out of control. Again, I do understand why Meghan and Michelle would have a connection. It makes sense. I don't see it as political at all. And I appreciate that Michelle would take the time to reach out to her and support her. That makes me like her a little more. Nor do I think she was trying to upstage anyone. Michelle is in a unique position to connect with her. AZ, I agree that you can disagree with Michelle and not be racist! I was upset that she never responded to my email about backyard gardens. I never thought her healthy eating program went far enough. What I mostly heard that can be repeated was criticism about her clothes, implying she was from a different species and did not know how to dress, and the unforgivableness of showing her complete well-toned arms. This is what I can repeat. Oprah has created and sponsored a school for girls in Africa. She and Meghan share humanitarian goals. It's not always about race and fashion and politics and celebrity. The healthy eating program was criticized partly because healthy food is generally more expensive than the usual carbo-laden fare of school lunchrooms. There was a strong political bias by a group that opposes Federally subsidized school lunch programs to the point that some school districts in certain areas of the country not only refuse Federal school lunch subsidies ad commodities but also brag about it. The healthy diet was simply beyond their budgets without Federal help--which they shun. As fruits, vegetables and lean protein sources are expensive, the program required Federal assistance. There have been various reasons given for objections to Michelle's healthy eating initiative. Few of them get at the heart of the criticism: politics and money. Already made my comment on the last post. I know this will be an unpopular opinion, but I don’t see why she gave a reading at this. I guess to me, if she didn’t know him, it feels like she was shoehorned in. I think so too. This felt the same to me as the speech she gave at the Invictus closing. Somewhat out of place for her to be doing this. I would think it strange if Harry gave a speech at an event for one of her solo charities. Anon23 I actually found it odd also. Anon23, however as it is a fundraiser for the general charity maybe they often have people read or sing that have no connection with the family. Perhaps the family asked her in tribute to Harry's recent marriage and their relationship. I can't imagine Meghan shoehorning herself in anywhere. It would be interesting to know whether every presentation and performance at this service in the last ten years has been made only by people who had a personal acquaintance with Henry van Straubenzee, or whether, as I expect has been the case, some have been drawn to do so by their strong interest in supporting the charity and by their talents and abilities in the performance areas that fit this type of service. It's not a memorial about Henry Van Strubenze though. 2 of the other 3 speakers also didnt know Henry. It's a fundraising event for his foundation. The foundation is about helping young ppl get education in Africa. The Van Strubenze foundation probably thought Meghan is the perfect person to speak at this event since this issue is obviously important to her. Even Harry's speech is about the foundation and it's work in education. I tend to agree with you on this. She’s an excellent public speaker and I appreciate the charity was set up with education in mind but she didn’t know him and it wasn’t as though she read something which could be used as a platform for her patronage’s..
Perhaps because shes a good public speaker? Charlotte provided the info in her post that these are Harry’s close childhood friends. The family is now close enough to Meghan to invite her to speak & read a beautiful poem. They were at the Sussexes wedding, sat near Meghan’s mother & other close friends. The Sussexes also attended Charlie’s wedding. People have public & private lives. She gave a reading, because it was a memorial of her husband's best friend. She read a poem. I suppose she volunteered because she wanted the spotlight on herself. Come on! It was a charity event and they commemorated someone who died an untimely death. And people start complaining about why she was there. I don't know whether I should cry or laugh at this. Where is our common decency or moral? I am actually stunned. Royals have a job too. When there is a tragedy, nobody questions why they attended ( Greenfell), they questioned why they did not attend (Diana's death), and I could go on. Did the royals know any victims personally? No. But it is their job, so to speak. Michelle Obama's quote on how black women are too everything is covering this whole mess a lot. Meghan did a reading because she was invited to do so. Nothing more, nothing less. Im not familiar with the expression "shoehorned in" but I gather it is not a positive phrase when used to describe another in their activities. Its sad enough the British papers seems to be having a field day at Meghan expense, lets make an effort to keep negativity out of these pages. Maybe the family asked her because she is married to Harry who was his best friend and because she was an actress and is a really accomplished speaker. Both Harry and William contributed to the service in different ways. I am sure that she wouldn't have been part of it if the family didn't approve! It is good that both Catherine and Meghan are being encouraged to contribute to these occasions. I noted that Catherine also spoke at the armed forces family function this week and was much more confident than she used to be. Remember "Girls can do anything!" How funny that people assumed I meant she shoehorned herself in. I was actually thinking of Harry. Anon 13:04 I think your thoughts make sense, except this seems to be a charity fundraiser sort of memorial, so she's adding an element to the evening as the wife of one of the two patrons. What an odd comment. Meghan is close to Henry’s brothers. She is Harry’s wife. Nothing else is required for her to read a poem. It’s not like she spoke about him. This was a Charity-related Christmas Carols concert. The charity is in fact the main focus. As to the discussion Meghan had with Michele Obama, it has nothing to do with political inclinations. It has everything to do with shared human values and how being in a public spotlight can be put to work to promote those values (in particular to those who often forget about values and get burried under the covers). What a powerful and wonderful reading in so many ways. The Obamas are liked very much by the Queen and by Kate/William. Harry has been special to Michelle--she called him Ponce Charming. Michelle continues to be greatly abused verbally in the US. During their 8 years they were often equated with apes---their treatment by some in the US is just atrocious and that sort of attitude will not be good for this country. I'm really glad that Meghan got to met Michelle to round out the social group but I feel they are kindred spirits. It sounds like a private not-for-Richard-Palmer meeting rather than a secret meeting. I find these activities to be very interesting -- the poem Meghan read is very powerful. I started as a royal watcher just to see outfits, jewels, but I am drawn to Meghan and Harry and find their activities to be very satisfying and inspirational. Wow Meghan is truly blooming ! I remember Kate being pregnant last Christmas, with KP telling us the baby was due in the Spring. Looking at Meghan, and even though KP has said her due date is Spring, it looks like it could be Feb/March ! Or is it twins ?! Either way she looks wonderful and hoping she’s having a trouble free pregnancy. I was surprised at a couple of things. Why was she asked to the reading ? I wonder if the family asked her to do it as a welcome into their close friendship ! I love Michelle Obama. but, have any diplomatic lines been crossed with Meghan meeting up with her, especially under the current discord ! Let’s hope not ! I’m keen to hear what patronage’s she’ll take up. Whatever they are, I’m sure as with everything she does, she’ll give it her heart and soul them ! Busy night for you Charlotte, with both our lovely ladies out and about ! So thank you for both posts ! Love, love, love Michelle Obama and I envy Meghan’s private meeting with her! It sounds like Ms. Obama had plenty of great advice for her. A lot of what is thrown at Michelle Obama is purely racist. I'm glad Meghan got to connect with Michelle as the Obamas are popular with the RF. And Harry is Michelle's "Prince Charming." I'm super excited about Harry and Meghan being seen again. I do not believe that Kate cried because of Meghan, or that Kate chastised Meghan, or that there were "rows," that Meghan is impossible to work for etc. I do believe that William was concerned about Meghan at first---seems natural. I'm sure Harry was very upset, particularly because he needed permission to marry. William made up for it by kissing her in public and by saying she was the best thing to happen to Harry. I do believe that Meghan expects more than some employees want to give, so perhaps she can make some adjustments or find better people. Very excited about her possible patronages. Does anyone have thoughts about twins? I read that betting on twins has been suspended. I don't think H&M would tell "us" if she was having twins. And the Clooneys had twins---maybe it rubbed off on Meghan. I am used to Kate barely looking pregnant except in a side view, and Meghan seems rather abundant. I bet sh's enjoying it though. Becca in US---where are you?? Absolutely does not always have to be racist. I am referring to the comments by officials and posts on FB that are so disgusting that I can't even write them. The cartoons made---it was 8 years of wonderfulness and 8 years of frankly being scared for the family. Becca, so very sorry about the death in your family! I so think you need to reconsider your work commitments vs your blog commitments. ) Seriously, I think you said you have four daughters and grandchildren? Any feelings about twins here? I thought they might try IVF if they had a hard time conceiving, which leads to more twins, but it doesn't look like they had any trouble. Dear Becca, I'm sending you a hug! So sorry to hear about your brother-in-law. I wish you and your family a lot of peace. It is Advent... a period that can fill us with real hope. Take care! Becca, I'm terribly sorry to hear about your brother-in-law. What on earth is Michelle Obama wrong on? She’s widely considered to be one of the more graceful, intelligent, and well spoken women of this generation. And no not every criticism of her is racially motivated but she also weathered some of the most vile racist attacks a public figure has been subjected too. It is very much the reason that many of us find her inspirational that she is able to maintain her level of grace and dignity under those circumstances. Lovely seeing a glimpse of Harry & Meghan, what a beautiful & poignant poem. I’m so happy that Meghan was able to attend Michelle Obama’s book tour, in addition to meet her in private. Everything was so timely with some of the nonsense that has been going on. I’ve had the opportunity to read Michelle’s book and it is wonderful, incredibly inspiring! So many important messages throughout the book & tour, one that I truly appreciate, “Never dim your light for anyone”. Yes, but sometimes we need to hold off with exposing our light when we are the new person on the job. Can come across too strong and be interpreted as trying to overshadow others. Start off slolwy and then gradually shine your light! Wow Meghan looks beautiful! That baby bump suits her. I kind of think this will be an early spring baby? Like March? She definitely looks 6 months along. And so glad she is there with Michelle Obama, an idol of mine. Amen! The poem was indeed suited for the charity but I also felt like it spoke to her. Sometimes I feel like some of those negative speakers are people with poor self esteem who just feel like HRH Meghan has way too much favour in her life. Whom Jah has blessed is blessed indeed. Thanks to all those showing love to her. I see some comments on why she should read a poem in a charity set up in memorial of a person she never met but must have a knowledge of him via her husband. I just think it is a matter of difference in intelligence. As if all they people supporting by attending knew him better. Paula, I also feel this poem is about her and it's telling the world, don't you see? I'm not trying to be better than you---it is wrong NOT to shine. I know she's very intelligent, and I know that's one reason Harry loves her. I don't know if Meghan selected this poem or perhaps the family/charity selected it but who ever did hit it out of the park! It's so appropriate not only for Meghan and what she's been through in the last year but for so many who have had to dim their own light in order to make someone else comfortable. @Floridagirl, you're second comment literally brought tears to my eyes, beautiful words! I'm so glad to get back to the good news. I find Meghan inspirational and I love that she tackles off-limits topics like menstruation. I love feeling like she has a kinship with Michelle Obama. All this nonsense in the tabloids about her "tearing the Royals apart" or making Kate jealous has been really disheartening, though not unexpected. Anon23@23:40. It was stated that the Duchess of Sussex was asked to read the poem. She may not have known Mr Straubenzee but she is Prince Harry’s wife. Prince Harry and Mr Straubenzee were best friends. From those two points of view, it is appropriate for her to read a poem. She simply read a poem NOT give a tribute. The poem, btw, is sooooo powerful. I’m sure the Duchess did an excellent job reading it. Thanks, Charlotte for the post. Nice to see Meghan at such an event after the tabloids current hit jobs on her. 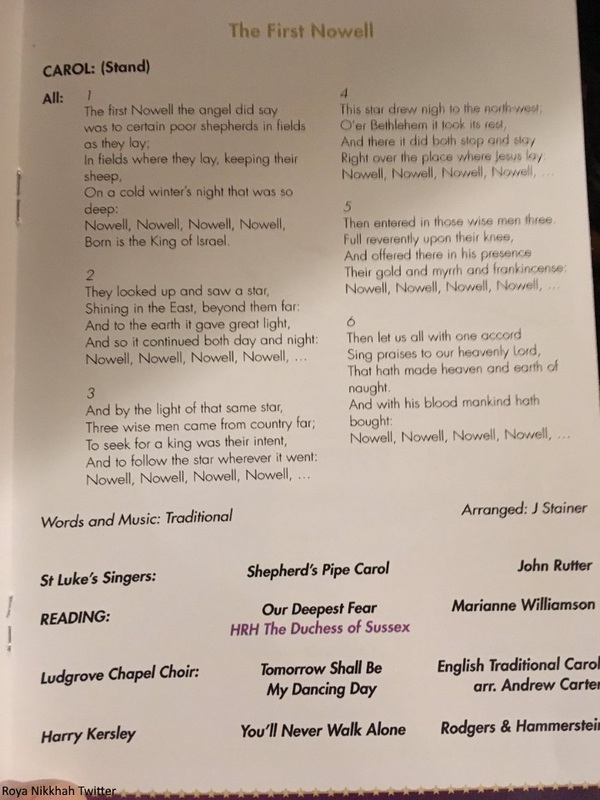 It might seem odd that someone new to this particular carol service such as Meghan would participate. 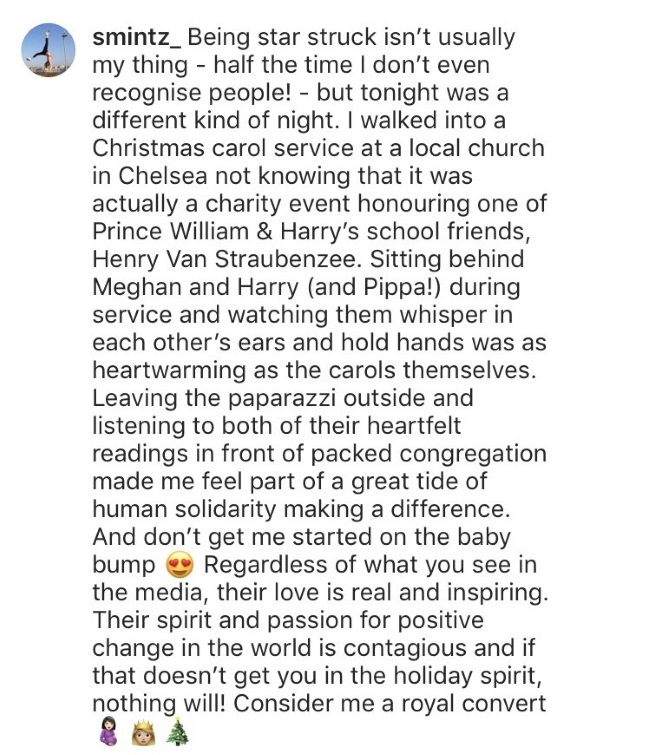 Seems to me that Meghan participating in the program is a testament of her acceptance by Harry's family friends. If I recall, Harry was best man at a recent family wedding. I think at services held in memory of someone, the people who speak are friends and family. But this carol service in support of a charity held in memory of someone has been held for ten years, according to reports, so I think it has devolved into a program that features inspiration and celebrates the spirit of charity and Christmas for a good cause. 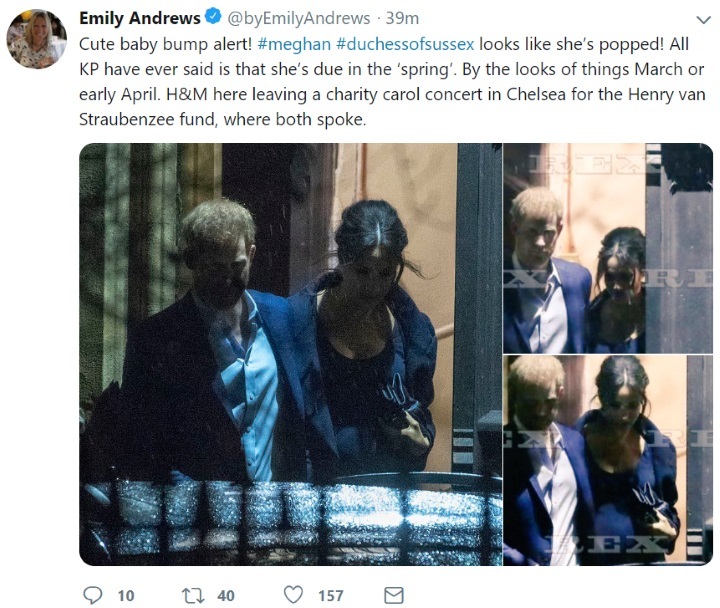 In other words, Meghan participated in a charity event with a personal connection to Harry and William. Very interesting game of thrones are played in the background here. The last weeks of smear campaign just does not want to end. I hope the couple stay strong, learn from their mistakes, if they made any, and continue to do some meaningful work. It is not their fault if the spotlight fell on them, it makes it clear as daylight who wants to do what with the platform given. I look forward to hearing her next project in the coming year. Dear Meghan, please keep shining your light. I wonder if those people who blithely dismiss racism can see how pervasive it is and how it reaches the highest levels. Simply shameful. I fear for young women and men of color; how soul destroying it must be for them. I think people generally dismiss what doesn't affect them directly. If it doesn't happen to them it can't be a big problem, which strikes me a great lack of empathy. What a wonderful surprise outing. I think Meghan was asked to give the reading by the Van Straubenzee family. I think she accepted because she loves Harry and cares for the things he cares about i.e. Invictus Games. Must we put a negative spin on everything she does? If it were a regular married couple we would think it was sweet. On another note Meghan's bump has grown so much! I'm thinking this might be a March baby? I also can't wait for the announcement of her patronages - I like the direction of where her work is going. Eagerly waiting for news of more engagements! I honestly can't recall-has Catherine ever spoken at this service in all the years she and William have attended? She is also a wife of a school mate and long time friend of the honoree and has attended family weddings. Is this service held on the same date each year or does the date vary? I was surprised it was held on the same evening as the DR, making it impossible for the Cambridges to attend. There was ample representation from the Middleton family, however, as usual. Wow, from what little we can see of Meghan it looks like she's glowing! And how adorable is her baby belly?!! This poem is simply awe inspiring and so timely, when so many in this world are being forced to dim their light, to hold back the best parts of themselves simply because of their race, gender or sexual orientation. I know personally, that there have been times when I've dimmed my light to make others more comfortable but no more. From now on I will shine my light proudly (while exhibiting good posture) allowing others to bask in it's warmth but if they prefer their own cold, that's okay too. Thanks Charlotte for this wonderful post! I just want to mention that First Ladies generally try to stay out of the political fray unless they are out campaigning for their husbands during elections. Michelle Obama is now a former first lady, and although she will always be criticized by some people, she is one of the most popular and admired women in the world. I don't think Meghan meeting Michelle has any political overtones. The royal family is also known to have had a warm relationship with the Obamas when they were in office. wow, her belly has popped for 5 months, but then again, she is so small. twins anyone? Meghan is just so inspiring, i love the poem. Wish we could see her adress it! Meghan had a meeting in Kings College today. 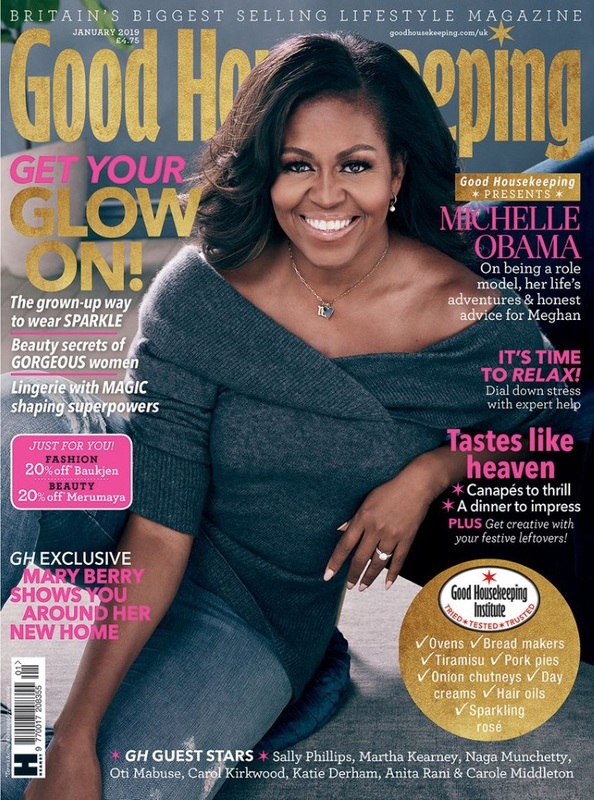 Did anyone else notice written at the bottom of the magazine cover--"GH Guest Stars"--Carole Middleton is listed as one . I find it really hard to believe anyone could just wander in to that carol service. The security alone would be a barrier and it is a fundraiser so I believe they sell tickets. I am sure the reading was beautiful but it doesn't enhance her image when things like the twitter post seem a little far fetched. I got curious and Instagram searched the post. According to some comments by the poster, it was a closed, ticketed event. Apparently she just didn’t know who all was involved when she got the ticket. If the reported threats against Harry and Meghan are factual-involving possible terrorism, hate crimes,death threats, and threats to two BRF heirs, I think Security (meaning Scotland Yard and possibly MI5-6) knew who each buyer of a ticket was and probably did at least a cursory screen. It is really difficult to believe that the supposed attendee was a person unknown to the family or family friends--i.e. "closed event;" harder still, that the person would not be aware of the yearly memorial concert in Chelsea and who usually attended. There is limited space in the church and I would think serious supporters of the family and charity would have a priority. Not just some random ticket-buyer who ended up sitting close enough to M&H to make intimate observations about them. They and the family would most likely have been seated near the front. This isn't a lottery ticket or Cold Play concert ticket we're discussing. It is superficially a rational explanation. A little thought may reveal its flaws. If the IG story is completely accurate, I imagine heads will roll over an apparent breach in security. There is more to this story. I am confused. What does some random person writing on Twitter has to do with Meghan's image? It had nothing to do with her. @ Tropical Girl @16:20. 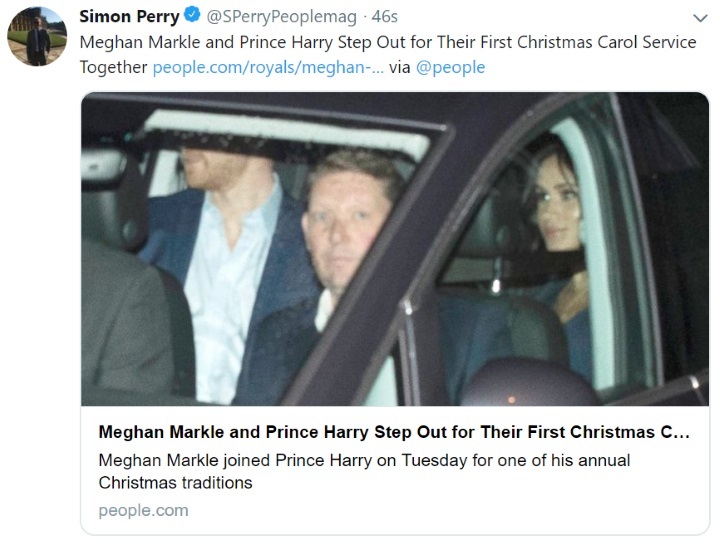 A random person, writing on Twitter, about a private setting, has more to do with the Duchess of Sussex than the Paparazzi who print a lot of amplified NEGATIVES based on a “source”. Who is the source? Name please. I would rather hear POSITIVES from a random twitter person than read NEGATIVES in magazines. I look for the POSITIVES.